Engility CEO Lynn Dugle told the Washington Business Journal in an interview published Thursday about how government contractors could help address threats from adversaries who have made advances in artificial intelligence and other technology areas. “We really do have to systematically and very quickly revolutionize the business models for service offerings,” Dugle said. She said she considers 2018 as the “best year” for Engility when it comes to win rates and consistency across the Chantilly, Va.-based government services contractor’s three businesses. Dugle, a two-time Wash100 recipient, noted that the company focuses its contributions on efforts to support the veterans and advance science, technology, engineering and math education. She also commented on Engility’s deal with Science Applications International Corp., which agreed in September to buy the former through a $2.5B all-stock transaction. 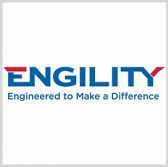 “The Engility team can take a lot of pride in unleashing what was there and really mobilizing a company that will charge forward and help SAIC accelerate their growth and contribute strong growth on our own as well,” Dugle said.